Pain in the hands and wrists is becoming increasingly more common. It may occur due to work related or repetitive stress injuries, sporting injuries or simply as a result of aging related wear and tear. Below we shall discuss the most common causes for pain in the wrists and hands. You will also learn about some of the current treatment options that are used and furthermore find out about the OSMO Patch… our 100% natural and non-invasive pain relief treatment. We hope that you may start your journey to becoming PAIN FREE today! Is hand or wrist pain currently affecting your sleep, work, exercise or lifestyle? People who have never experienced pain in their hands or wrist will normally not fully appreciate just how painful and debilitating this can be. Simply baring weight on your hand can cause unimaginable pain shooting down through the hand and even up and down your arm. Simple tasks such as opening jars can become unbearable and restless nights due to pins and needles can leave you feeling very despaired. Before your wrist and hand pain were simple tasks so much easier, and activities so much more enjoyable? The sooner hand and wrist pain is addressed the faster and better are your chances of becoming pain free. Make sure that you don’t make the common mistake of trying to push past your pain…. This will just cause additional injury and result in further pain and injury. Frustrated and feeling that you are doomed to now suffer with this pain for the rest of your life? People with hand or wrist pain often feel very upset and frustrated about their injury. Some individuals will not know when pain will strike them and when it does it is normally extremely intense and without warning. For others it is ongoing and relentless affecting each and every day of their life. Did you know that by identifying if your wrist and hand pain is acute or chronic may actually help identify how to aid recovery? Generally speaking pain in the hands or wrists will either be ‘sudden and acute’ or ‘slow and chronic’. If you are able to identify which of these 2 categories your hand or wrist injury falls into then it may be very beneficial in eliminating the cause. This can then dramatically expedite the recovery. Below is a list of the most common causes of hand and wrist pain. You can simply click on any of the associated links to learn more about the conditions. We shall also discuss the existing treatment options… and see how the OSMO Patch, our 100% Natural treatment may be ideal for assisting in the reduction of inflammation and pain caused by these common hand and wrist injuries. 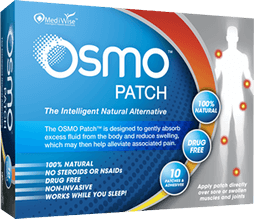 You may also wish to watch the video on right to learn exactly how the OSMO Patches work. Common Causes of Pain in the hand and wrist. Most hand and wrist pain causes will fall into one of 3 main categories: inflammation, wear & tear or fracture. A small fluid filled sac within the wrist know as a bursa which acts as a cushion between the bones and overlying soft tissues helping to reduce friction may become inflamed. This may result from impact or overuse of the wrist and hand. When inflamed the bursa in the wrist will normally fill with fluid. This condition is known as wrist bursitis. The bursitis will often present as a lump on the wrist similar in size to a ping pong ball. Wrist bursitis may not always cause pain. For further information and to discover how the OSMO Patch can help relieve swelling and the associated pain due to medically diagnosed wrist bursitis simply click on the link below. Medically diagnosed Carpal tunnel syndrome (CTS) results from compression to the median nerve often caused by inflammation and swelling. The medial nerve runs through an area in the wrist called the carpal tunnel. Pressure on this nerve normally results in tingling, numbness as well as extreme pain in the hand. For further information and to discover how the OSMO Patch can help relieve inflammation and associated pain due to medically diagnosed carpal tunnel simply click on the link below. Wear & tear in the hand or wrist can cause swelling and inflammation. This can often then lead to conditions such as Carpel tunnel. For further information and to discover how the OSMO Patch can help relieve swelling and the associated pain due to medically diagnosed wear & tear injuries such as carpel tunnel simply click on the link below. 4. Fractures or broken bones. Fractures and breaks in the hand or wrist will typically cause extreme pain in the area. Please consult your health care professional should you be experiencing this type of pain as these injuries need to be treated directly by a medical professional as soon as possible.